I’d like to take a moment and introduce you to the Linn family! Meet Angie, Josh, and their son Jimmy! Some of you may know Angie already. Her mom is Diane who blogs at Theology for Girls. These are exciting days for the Linn family! Currently they are in the throes of a very long and arduous adoption process that is coming down to the wire. Right now, somewhere in Thailand, is a beautiful little girl waiting in a foster home for her forever family to come and get her. Angie’s been sewing away and selling all kinds of beautiful things such as this apron, to meet their goal of $10,000. Here is a sample of the kind of work Angie does. This pretty little apron is called "My Favorite Things." 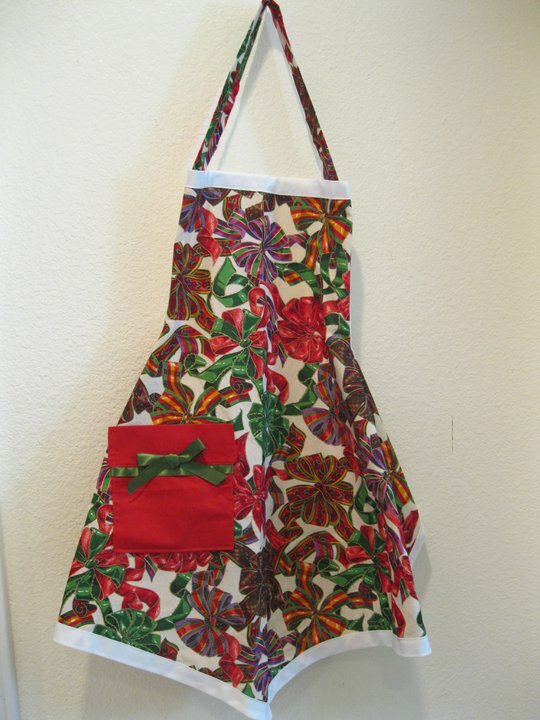 If you are interested in finding out more about Angie's aprons, you can contact her at joshangielinn@yahoo.com. She will send you some pictures of her work along with details on pricing. Despite all of their progress and hard work, they are still falling short of their goal. In order for their “match” to be formally accepted they need to come up with $6,500 in the next ten 7 days! Would you please consider making a contribution to their adoption fund? You can be assured that every single penny counts! Please click here to visit their adoption blog and make a donation! Lastly, would you please join me, and the many others who love them, and pray for them as they wait on God and trust in His providence? Oh Christina! I’m so blessed by your caring heart in sharing this on you blog!!! We are all on pins and needles over here now. When I opened my Christmas present it was a photo collage of the grandkids, only wait!…there was one extra! 🙂 There were plenty of tears of joy for this grandma! Little Lydia is such a beautiful baby and I just can’t wait until we have the “okay” to post her picture online. Again, thank you so much my sweet sister for sharing this prayer request. Diane, I cannot even begin to tell you how the joy and the honor is all mine! It’s a small scratch on the surface of the great need that is at hand but God is able to multiply all our efforts unto His glory! Praying for you all! Oh, and I can’t wait till you get the “okay” to post pics of Lydia Joy, too! Yaay!!! With much love and blessings! I missed this post earlier! Thank you for haring this update. I will try to contact her soon.